My favorite dog book, Living With Dogs, isn't really a dog book, per se. 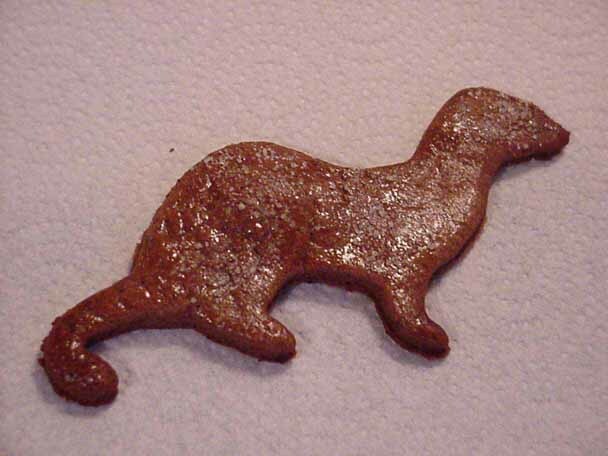 It's about design that pertains to dogs: dogs in art, dogs at home, dogs as collectibles, and so on. 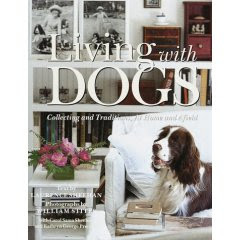 Written by the husband and wife team, Larry and Carol Sheehan, it presents dog owners, dog memorabilia collectors, dog breeders, and dog enthusiasts in essays about the lives they spend with their dogs at home and work and at leisure. A must for anyone who loves dogs, I'm now on my third copy. One went to my sister in law, who, like me, owns Springers, and one cover was destroyed by my puppy. We're unashamed dog lovers in our family. Two dogs live in our house, an English Springer Spaniel named Georgie who looks exactly like the dog on the book's cover and Sammie Jo, a Cavalier King Charles Spaniel. Of course, being the design freak that I am, Georgie came to live with us first and when the time came for a new puppy, I wanted a lap dog. The only lap breed that matches the coloring of a Springer is a Cavalier, so, that's how we ended up with Sammie Jo - she's a miniature Georgie. They do look cute together, I have say. Before these two dogs became Webbs, we had a few beagles along the way - stupidest dogs on the planet - and a couple of cats too. I learned the hard way that the only way humans and animals can happily cohabit a home, is if you have slipcovered furniture. Now, before you hold your nose and say "I despise Rachel Ashwell" and Shabby Chic-less, slipcovers don't have to be loose and wrinkled. You can have slipcovered furniture that is very tailored, and you certainly do not have to have white sofas with piles of rose covered pillows. 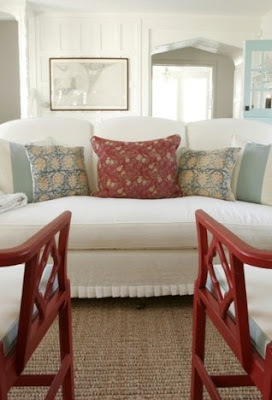 Give me a minute or two and let me show you that slipcovers can be dressy or even contemporary. If you plan on having custom made slipcovers (the only ones I would recommend), you should wash your fabric before the covers are sewn. If you choose a fabric that doesn't wash well, you can just dry clean the covers once they get dirty. I would never again live with furniture that wasn't slipcovered, even if I didn't have animals. Once you have had the ability to toss your upholstery in the washing machine, it's hard to go back to having it steam cleaned by some clueless employee of Steamomatic. Aw, isn't she cute? Sammie Jo, the always hungry, stone deaf, Cavalier King Charles Spaniel. Here's she licking her lips thinking the camera is a big steak. Georgie, the shy, sensitive one - totally scared of the camera. That's Ben's big stomach in the blue shirt that Georgie is burrowing her head in trying to escape the mean camera. Georgie's too smart to fall for my tricks like Sammie Jo. 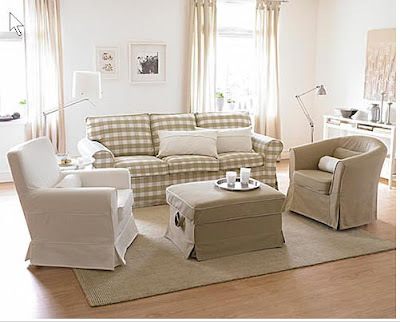 White slipcovered sofa dressed up for a living room or a family room. Here's a khaki slipcover, again dressy enough for a living room. Loose white linen, good for a sunroom or den, Madeline Weinrib rug. 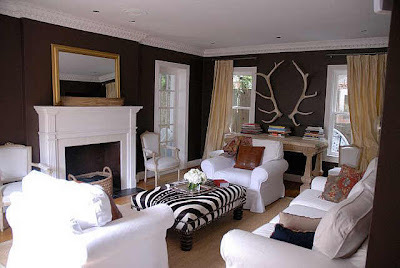 Home of a Houston purse designer, white slipcovers contrast with dark chocolate walls. Another Houston home, this owner is an interior designer. 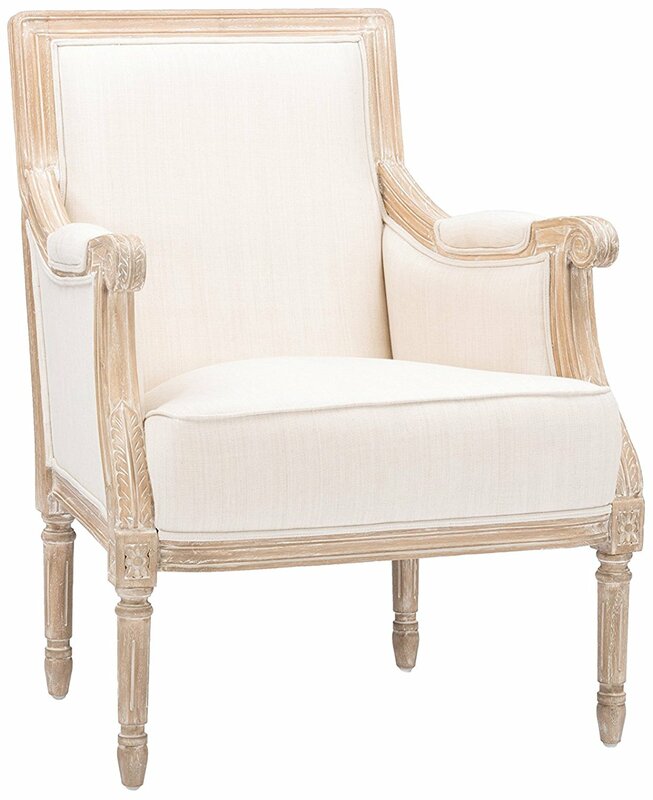 I love the slipcover treatment on the french bergere. 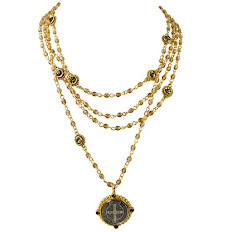 The tabs allow the antique wood frame to peek through. My breakfast room chairs, scalloped slips in two pieces, the top is tabbed, again, to let the antique, painted wood, chair frame show through. 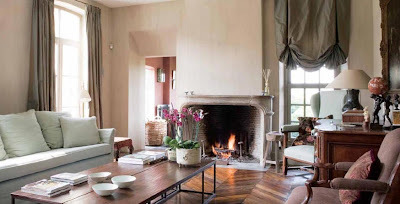 Here is the "new" look of Rachel Ashwell's Shabby Chic: more modern, less cottagey. Again, Rachel showing leaner lines in her furniture. 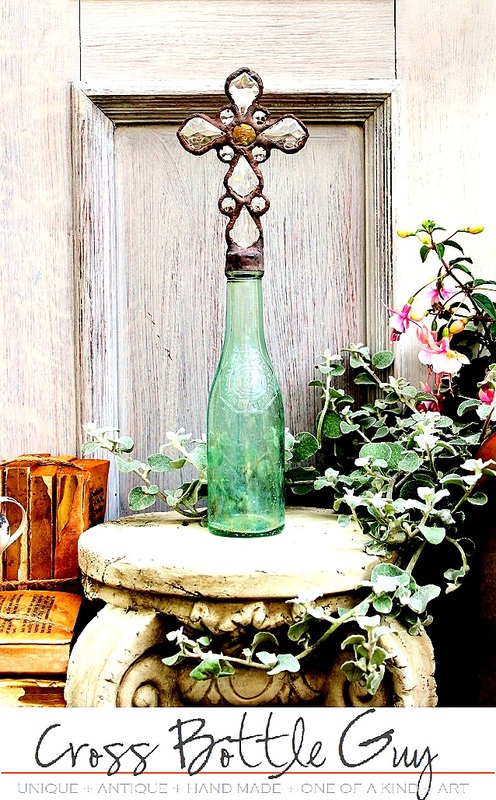 Although the chandelier, a Ashwell trademark, is a dead giveaway that it's Shabby Chic. 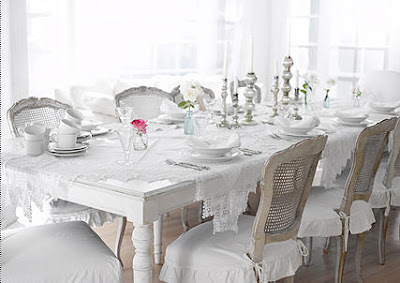 Classic Shabby Chic: ruffled slipcovers, white painted furniture, silver, and lace. 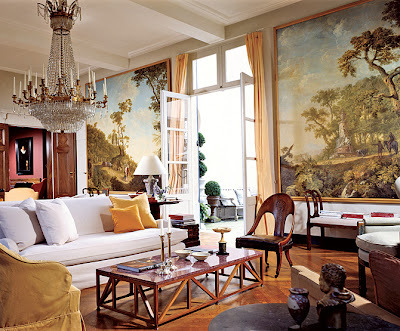 Alessandra Branca from Chicago designed these slipcovers to not be obvious. These slips are purely for pet and children protection, not to have a "slipcover" look. 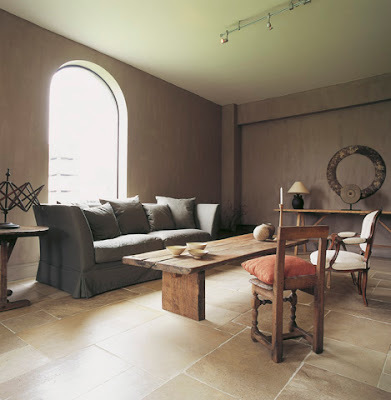 Windsor Smith's slipcovered sofa has a pleated detail that can go from the living room to the bedroom. Jackie Lanham's slipcovers are made to be noticed given the large ties on the back. 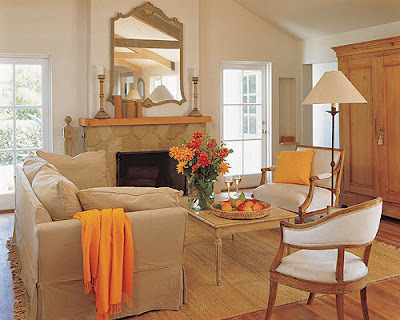 This is a beach house, which is a perfect place to use slipcovers. You don't have to spend a fortune on custom slipcovers if you are budget conscious. IKEA sells this line of furniture with many different fabric options. 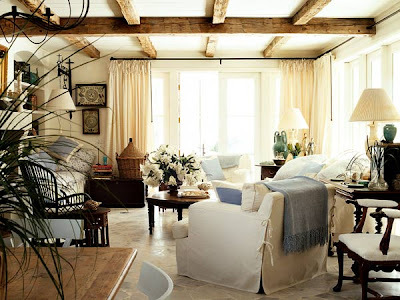 Above, the furniture is shown in khaki and white, and then the same furniture is shown with navy and white slipcovers. This line of furniture is SO inexpensive, making it perfect for a playroom or a second home. It's actually very comfortable and a great buy. A company that sells more expensive slipcovered furniture than IKEA is Lee Industries. This sofa above is definitely a playroom or beach house candidate. 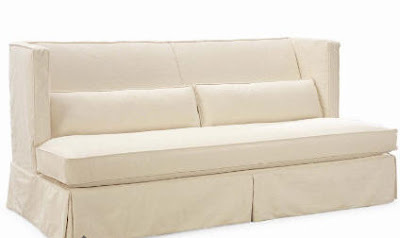 This cream slipcovered sofa, above, is also from Lee Industries. It can go in the living room or the family room. 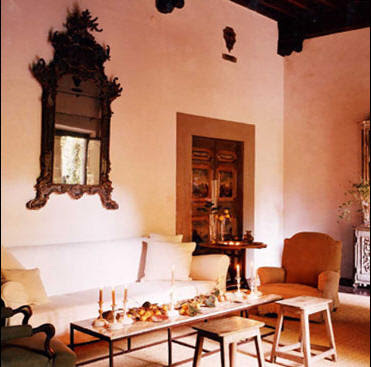 It was designed by Robert McAlpine, noted architect and interior designer. Lee carries several of his sophisticated furniture designs. Mitchell Gold single handedly brought furniture to the masses with his designs and helped fueled the Pottery Barn and Crate and Barrel furniture revolution. Basing his furniture on classic lines that mimic George Smith designs, he kept his wholesale price points low enough so that furniture no longer had to be "paid out" on credit. This advertisement shows an arrangement which a young married couple would put in their "dressier" living room. In Houston, no one makes better custom slipcovers than Shabby Slips. 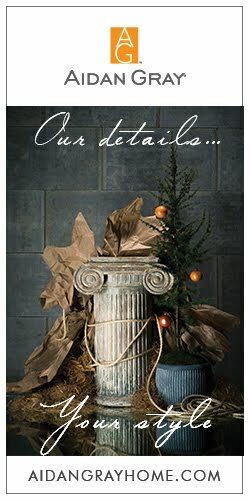 Branch stores are now located in New Orleans, Rosemary Beach, Austin and Santa Fe. This picture shows the Santa Fe showroom, with it's more western accent. 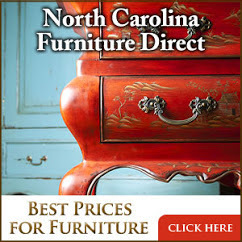 Another small furniture chain that makes slipcovered furniture is Quatrine. Above is a typical slipcovered sofa, the trim is what makes it special. Slipcovered dining room chairs from Quatrine. 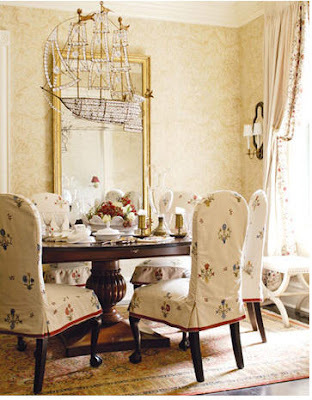 Dining room chairs are another great item to use slipcovers on, whether you have animals or not. After a messy meal, toss them in the washing machine. These ruffled slips show the more feminine side of slipcovers. Here is a Quatrine showroom, showing their more contemporary slipcovered merchandise. These slips are tight, giving no hint of their practicality. This dog won a nationwide photo contest that Quatrine ran. No need to worry about dirty paws or dog hair on this sofa. The contest makes it obvious that they target dog owners for customers. Above, another retail outfit, BeachDwelling, has a store in Alabama, but they also do a large internet business selling slipcovered furniture to the second home market. Here, are some of the dining room chairs, furniture, lighting and accessories that they sell. Again, BeachDwelling, this time showing a chaise lounge. Comfy! Grey linen is a frequently used fabric in Belgium. The typical Belgium design features oversized furniture, oversized accessories, and antiques used sparingly but effectively. Wood is oftentimes not stained, but left its natural color. Here's a lighter, slightly more cluttered Belgian living room. Not as severe as usual, the draperies lend a feminine touch. This slipcovered chair and ottoman is oversized, and overly comfortable looking. Gorgeous armoire, gorgeous wood floor, practical slipcovered dining chairs and skirted dining room table. How long do you think this sofa is? Ten or eleven feet? Unreal! Belgium again. 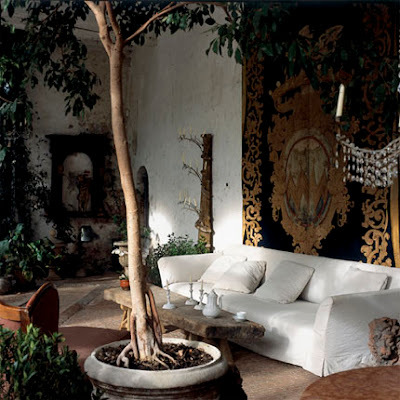 Only Axel would put a antique tapestry and chandelier in a orangery. Another 10 ft. long Belgian slipcovered sofa. Contempory Axel. The painting and the tree take center stage here. 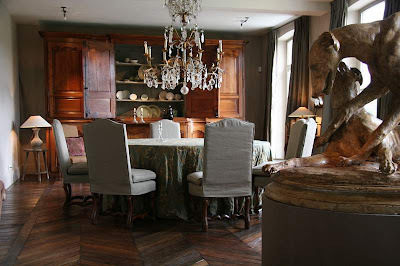 Again, the light, unstained wood, large furniture, linen slipcovers, and sparse interiors, are all hallmarks of Belgian design. This month's House Beautiful features a home done in the "Belgian" style. HB declares that Belgian is the new Swedish, is the new Tuscany" etc. If you are interested in learning about Belgium design, try Betafish for gorgeous books on the subject. 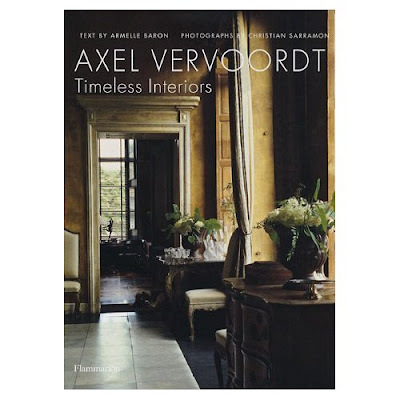 Additionally, Axel Vervoordt has a highly anticipated book due to arrive in the bookstores any day now. I have been out of pocket for awhile & just catching up on your wonderful posts....WOW I have missed a lot and that whole dog thing....unreal! I cannot believe the nerve. This info on slips is awesome. I agree no other way to live with or without pets. Thanks for such a variety of looks, obviously you spent some time gathering all the great photos. Muchas Gracias from South Texas. 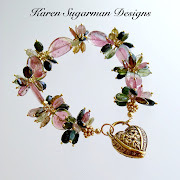 Wow - you outdid yourself on this post! What beautiful, beautiful pictures. I love your style. 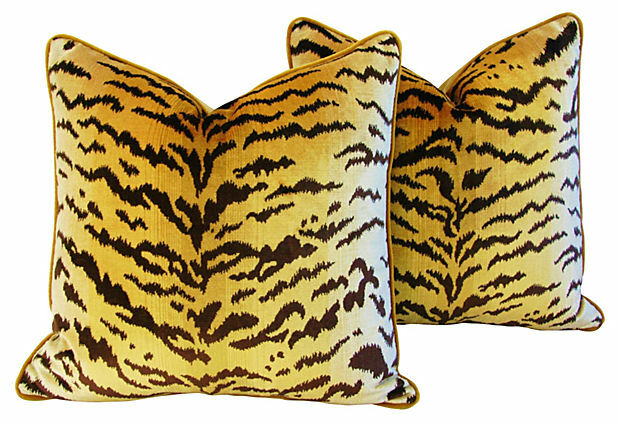 Which fabric do you use when you have slipcovers made? If you have a minute, I would love it if you could stop by my blog today...I have a question and I would love your opinion! I love the pictures and getting to see all of the possibilities in terms of style. The sofa with the little pleated skirt is darling. I've loved slipcovers ever since seeing Mary Emmerling's in "American Country". My lab's own slipcover for her bed is drying right now. Slipcovers are invaluable if you have pets,children or even husbands lol!! 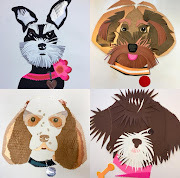 What a great post on your darling pets and slipcovers. 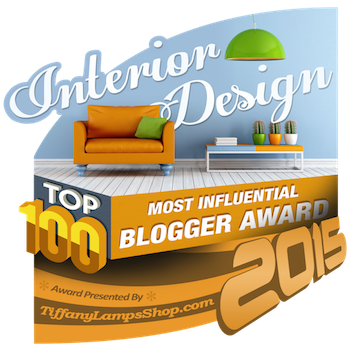 I am a big fan of slipcovers and have always had white slipcovered sofas in my own home. Your breakfast chairs are particularly stunning! And yes it is very, very important to pre-wash your fabric (Private Joke)!! Excellent post with such beautiful inspirational photos. Fantastic CdT! 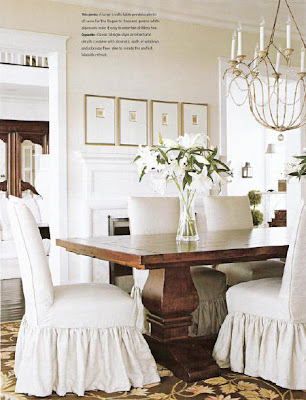 Love your chairs with the scalloped seats - they are very smart. Good on you for mentioning McAlpine - he is my favourite. I'm so inspired I feel like I need to immediately run out and slip cover something! How fun. I love this post - you gave me three new designs for my slipcover book. Didn't know I was writing that one did ya? I'm absolutely in love with the tabbed seamed covers on the bergere's and dining chairs- so creative! Do you know Charles Faudree? I've been following him for YEARS in Traditional Home.....you and me, I think our hearts veat at the same time. This is so much eye candy at one go! Not that I am complaining ;-) Such comprehensive post Joni! You are so right about "once you go slipcover, you can't go back". We finally tossed our old Crate and Barrel slip sofa for a traditionally upholstered one and I am missing being able to to throw the covers into the wash every 6 months. There is nothing better than having a nice, fresh sofa cover! I may borrow some of your photos to have a new cover made. Great post! I can't see the dogs either! Or most of the other pictures. I love springers-they're my favorite breed. And at least I can see the photo of your two piece slip covered chairs. Those are beautiful!!! Great post. 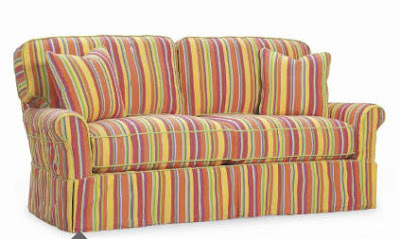 I am thinking of getting slip covers for my Ethan Allan sofa. I can only wash the seat covers and the rest is getting a bit grotty looking, as that's where the Connor-pup spends time when I am gone. i have that lee sofa, though it is sans slipcover. it is natural linen with nailhead trim. don't tell anybody but i take the cushion covers off and throw them in the washer on wool cycle and put them back on the couch wet, just like you would linen sheets. i do this because my cavalier puts his dirty boots all over it! your girls look cute without their fuzzy boots - maybe we should follow suit! I think slipcovers are great for everyone! I was especially grateful for mine after I learned that my dark denim jeans rubbed off on my cream colored cushins. Oops. Love your dogs too. Sooo cute!!! Patricia, Thanks - no You are the Best! Habit: I know!!! Jeans leave stains on light color upholstery. I assume they do the same on dark. Thanks everyone for the comments. Sorry about this afternoon when the pictures vanished! What was THAT all about, it took me all day to do this post and then to I had to do it AGAIN, OY!!!! Oh my gosh, this is the longest most detailed informatively wonderful post ever! Thanks for spending so much time on this! I find it amazing the amount of time and effort you ut into each post. 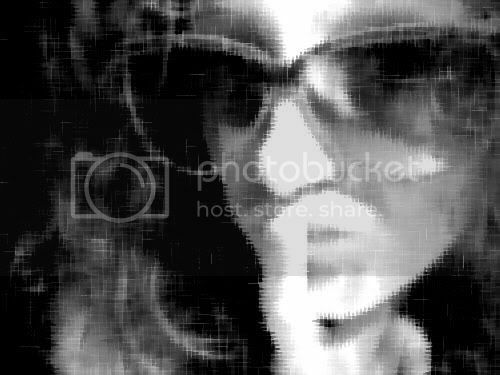 Lovely collection of slicovered images. All inspiring. Some surprisingly modern and sleek. And who knew shabby chic had gone so.. chic!? keep up the amazing posts, darling! why pick on beagles? Just because you had a "stupid" one(Your Words) does not make all of them stupid. You should be a little more sensitive to dog owners. Holy moly! that zebra ottoman, that weinrib rug. The smelling salts someone, please! Seriously, you have done a service to all of us. My dog brings immesuarable happiness to me but it's a challenge to have a house that is stylish and pet friendly. This is like the source book for dog-friendly sofas and slipcovers. Love it. I just love this post!!! Well, I can't say that my dog sheds...but growing up I remember the growns of my mother and trying to remove all the fur from the edge of our sofas. 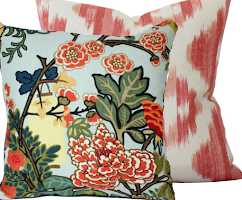 I think slipcovers are fab is done right, and I'm so glad you did a post on this Joni! I'm in love with this post and with your shy Springer -it makes me miss my Ella (I had to put her down last month). She was such a messy dog that loved the great outdoors and then loved my white furniture to an English Springer Cream color! Anonymous: Welcome back (blush) - you must love my blog, you keep returning with such great comments!! Sorry you think I am "picking" on beagles. If you ever were to look at a list of doggies by rated by intellegence you will see it is not just me who thinks beagles are dumb. They are. They only thing beagles care about is their next meal or where they can steal their next snack from. Sorry if that hurts you. Was a beagle your first girlfriend/boyfriend back in the days where you lost your virginity????? ANd what a relevant subject! We have a doggie as well, and four ferrets, and they are one of the main factors we consider when choosing new furniture, especially rugs and sofas. 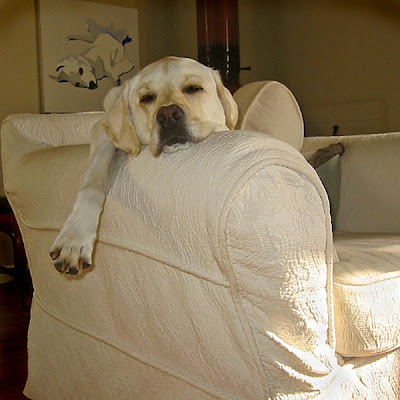 Our slipcovered furniture makes living with pets much easier. I have a tri-color cavalier as well. Her name is Dottie! Great post! Lovely inspiring pictures. I'm wanting to do slipcovers, but my decorator seems hesitant. Can they really look as neat in real life as they do in these photos? Also, is there any fabric that won't work? My 100% linen is at the workroom awaiting my decision. Do you usually recover in muslin first, or just slipcover over the old? Thank you. Yes slipcovers can look nice and not sloppy - it depends on how tightly they are sew. Tell your upholsterer you want tailored slips, not loose slips. Be sure that you've washed the linen in hot water and dried it in a dryer. If the fabric on your sofa is dark or bright, yes it is better to upholster it in muslin first. An extra expense but worth it. Slips aren't cheap - don't do it to save money. If you do it correctly - they should last about 5 years or more. When you wash them after they are made, take them out of the dryer before they are completely dry - then put them back on when slightly damp. 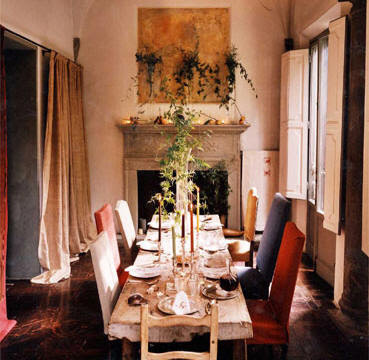 don't listen to your decorator who is hesitant - why is she hesitant? that's ridiculous! email me at mrballbox329@aol.com if you want to discuss further. hi joni! well i'm looking for slip covers and went straight to Living with Dogs!!! Loved the beach dwelling comfy chaise + jackie lanham's large ties on chairs in the blue and white room. i'm thinking about my bedroom + hubby + doggie!! seagrass wall-to-wall in the bedroom with new botanicals that i bought at antiquarium......let's talk! Ahhhh, slips slips slips! Can't get enough of 'em. We have done several slips with pleated seam finishes here lately and they are oh so sweet. More Joni pleeeeze, more slipcover photos! oh YAY!!!!!! 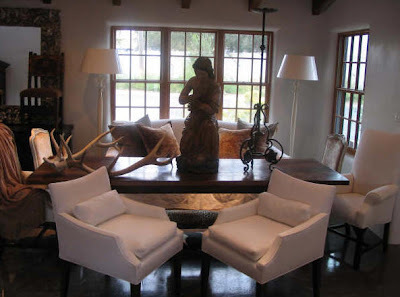 Thank you so much for posting the picture of the living room of the purse designer in Houston. 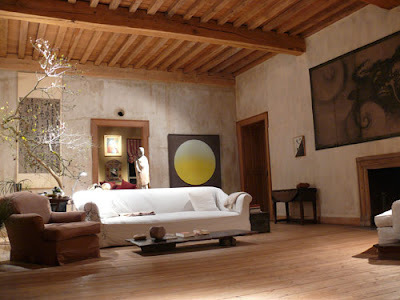 I've been questioning the taste level and play of the kilim pillows against white sheets and Euro's. I think I love it - well on her sofas anyway. Hope it looks as nice on the guest room bed. i know this is an old post, but it came up when i googled "custom slipcovers" :) i'm having slipcovers made for my dining chairs in a white cotton duck. do you think that should be okay vs. a linen? i wanted more of a crisp look. i know i would have to dry clean it if it ever got dirty. coach outlet has a zippered closure and buckles for extra security. Shiny brass hardware, rounded leather handle, and an interior pocket. It also includes a limited edition Hawaii luggage tag and lock.Where there are women, there are bags. Where there are bags, there are coach outlet store online. 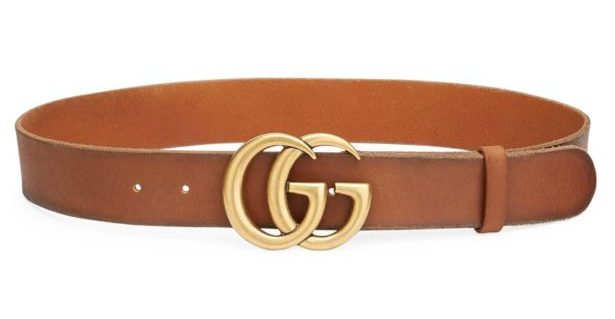 Coach products are the direction indicator of the latest fashion and trend. Great post. I am thinking of getting slip covers for my sofa. Besides, if you have an extra large sofa at your home then you can consider buying the extra large sofa covers. 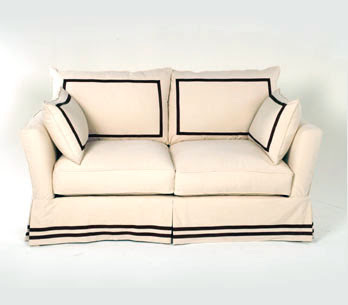 This sofa covers have a good length and breadth which will surely fit your sofa.